Since 1891, the sand hills and gorse that form the backbone of what is now the Burnham & Berrow Golf Club — located in Burnham-on-Sea in Somerset, England — have stood the test of time and continue to do so. While admirers of the Erin Hills Golf Club in Wisconsin talk about how that piece of property was a natural location for a golf course, the same can be said about Burnham & Berrow. The presence of so many perfectly situated sand dunes, the wonderful views of the adjacent Parrett Estuary and Bristol Channel, the steady (and, at times, strong) winds, and tight, yet fair, lies are wonderful attributes of this links course.Credit must be given to Charles Gibson for his design skills as he was able to efficiently utilize what Mother Nature provided as he created a golf course which continues to challenge, frustrate, stymie, and, in some odd way, entertain golfers as much now as it did more than a century ago. 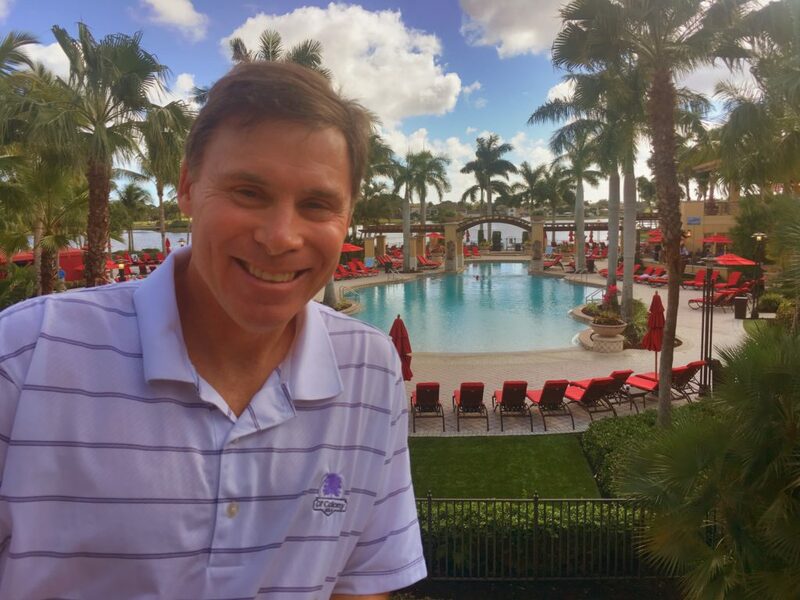 Simply put, Burnham & Berrow – a par-71 layout that measures nearly 6,700 yards from the back tees — is a golf course that attracts avid golfers who crave a classic links golf experience. Burnham & Berrow never disappoints. Burnham & Berrow is a links course that will truly reward good shots, while also punishing you with a poor result on any indecisive attempts to advance the ball. The Burnham & Berrow Golf Club will reward a golfer who plays the course based on what it’s willing to give you on any given day, which is always influenced by the current wind conditions which can change at any given moment in time. The 17th green at the Burnham & Berrow Golf Club, with the clubhouse in the distance. (photo credit: Geoff Ellis). The prevailing wind at Burnham & Berrow is often out of the southwest – right off the Atlantic Ocean. The wind usually makes its presence known from the outset as the 1st hole — a bunkerless and treeless 380-yard uphill par four — is usually played into a testing breeze. On a windy day at Burnham & Berrow, bogey golf is acceptable and applauded. 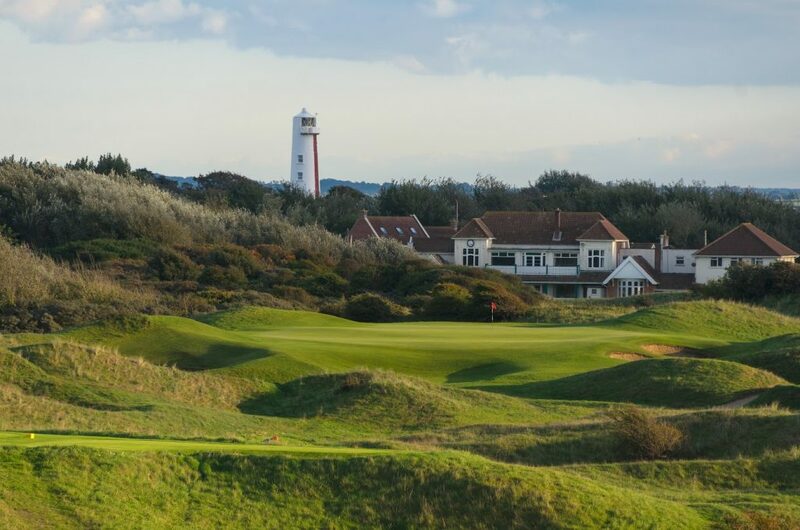 While Burnham & Berrow is a classic links course, you don’t truly realize the proximity of the course to the nearby Perrett Estuary, which feeds into the Bristol Channel, which feeds into the Atlantic Ocean, until you play the 4th hole. It’s a breathtaking moment as you step foot on the 4th tee, especially if you are not used to seaside golf. If there’s one hole that is the epitome of the overall Burnham & Berrow experience, it’s the 4th hole, a 514-yard, left-to-right dogleg par five. To post a par at the 4th, it takes a successful combination of the ‘P’ words: A ‘Powerful’ drive that ‘Penetrates’ the ever-‘Present’ sea breeze; a second shot that ‘Properly’ takes into account the wind and is ‘Precisely Placed’ on the fairway; a third shot that is struck so that it finds a ‘Positive Position’ on the green which then requires no more than a ‘Pair’ of ‘Putts’ for a ‘Par.’ At the 4th, the wind at Burnham & Berrow is probably at its peak so it’s absolutely necessary to play each shot as if it’s the only shot you are hitting that day. The very next hole – the 5th — is a classic, long, uphill par three which, on paper, looks rough, tough, unfair, and quite penal In reality, though, it has a forgiving nature, too. While the front, left, and right portions of the green are guarded by large sand bunkers, any shot that is left of the pin may well bounce right toward the middle of the green. And, any tee shot that is long and left has a liberal landing area which allows you to pitch and putt your way to a par. Like so many links golf courses, the transition from the 9th green to the 10th tee takes place ‘out in the country,’ which is quite a long walk to the clubhouse. There’s no hospitality hut or snack shack at the 10th tee so come prepared with a snack and a bottle of water if you expect to get hungry and thirsty at the turn. The view of the 2nd hole, from the back of the 2nd green at the Burnham & Berrow Golf Club. Burnham & Berrow is a links golf destination that attracts avid golfers who crave a classic links golf experience. Burnham & Berrow never disappoints. 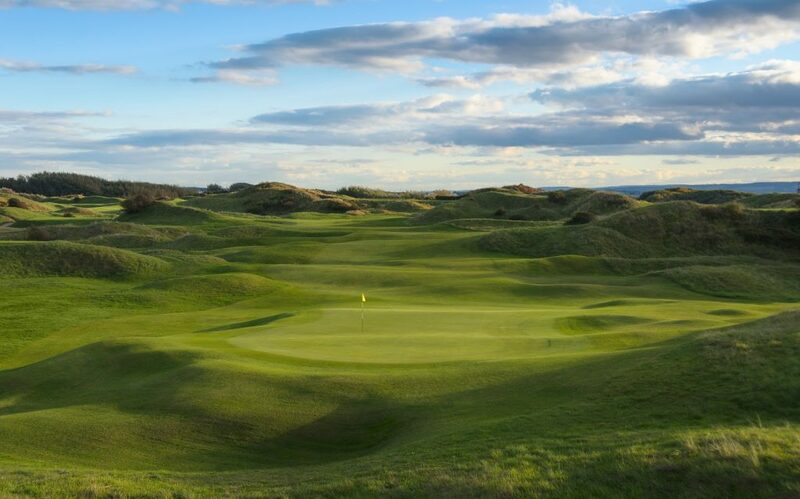 Burnham & Berrow is a links course that will truly reward good shots, while also punishing you with a poor result on any indecisive attempts to advance the ball. The Burnham & Berrow Golf Club will reward a golfer who plays the course based on what it’s willing to give you on any given day, which is always influenced by the current wind conditions which can change at any given moment in time. If you can avoid any of the 44 well-placed fairway and greenside bunkers at Burnham & Berrow, that is a major victory. Other obstacles and areas to avoid are the Rushes, the two grass-filled bunkers to the right of the 8th fairway; the long canal that lurks from tee to green along the right-side of the 8th fairway; the dirt track which crosses the 13th fairway and is in play if your ball finishes on the hard-pan surface; and the Kitchen, which is a rough, somewhat hilly, overgrown area about 100 yards from the putting surface of the 15th green. Originally, when this golf club opened its doors back in the early 1890s, it was called the Burnham Golf Club. In 1896, the club’s membership wanted to expand the course to 18 holes by extending the property line to the Berrow Church. To get access to this additional property, the powers-that-be within the club had to make one major concession to the local Lords of the Manor: change the club’s name from the Burnham Golf Club to the Burnham & Berrow Golf Club. The agreement was made and the rest is history, as they say. Burnham & Berrow is as popular an attraction now as it was ‘back in the day,’ when the great J.H. Taylor was the club’s first head pro at what is probably Somerset’s most famous golf course, which has also served as a qualifier for the Open Championship. Back in the early 1900s, Taylor – who won five Open Championships in his competitive career — was quoted as saying that Burnham & Berrow is “one of the most sporting courses conceivable.” Taylor’s comments about Burnham & Berrow would still ring true today. In 1913, golf course architect Harry Colt was hired to upgrade and give a facelift to Burnham & Berrow. Colt utilized the natural conditions and created a golf experience that remains as relevant today as it was more than a century ago. The church tower from the local Anglican Church overlooks the 12th green at Burnham & Berrow. One of main reasons why Burnham & Berrow is such an attractive destination is because of the ongoing efforts by the head greenkeeper and the maintenance team at the club. The course is only in great shape because of a daily commitment to excellence by head greenkeeper Richard Whyman and his crew of dedicated workers. The dedication to excellence displayed by Whyman and his team is not easily achieved because weather patterns – the wind, sunshine, and rain — are constantly changing at Burnham & Berrow. “Because of the steady winds at Burnham & Berrow, one of our biggest issues is keeping the sand in the bunkers,” says Whyman. The next big course maintenance project at Burnham & Berrow is to upgrade the quality of the teeboxes. “We are striving to improve the firmness of the surfaces of the tees,” declares Whyman. One of the special aspects of playing Burnham & Berrow is securing access to The Dormy House for overnight accommodations. This structure, which is a one-minute walk from the first tee, can house eight people in four twin-bedded rooms. The rooms are clean, quiet, comfortable, and spacious – each with its own private bathroom. And, there’s access to a TV lounge that serves as a common room for those staying at the Dormy House. 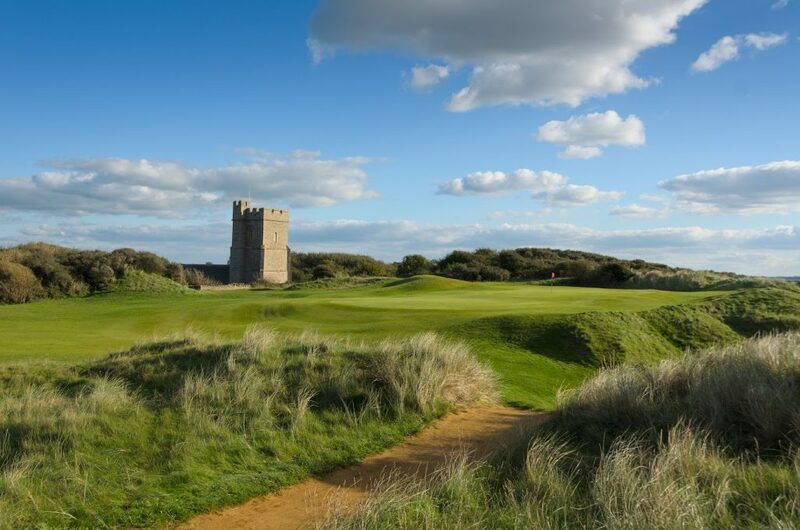 When you play at Burnham & Berrow, there’s more than just the 18-hole championship course. There’s a nine-hole Channel course, too. The Channel course is interwoven amongst the 18 holes on the Championship course. Among the holes on this par-35 layout, no par fours are any longer than 385 yards and there are two short par fours which are roughly 300 yards from tee to green. 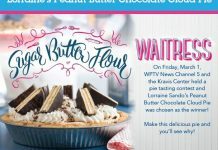 It’s a perfect way to prepare for your round on the Championship course. It’s worth noting that in 2015, National Club Golfer ranked Burnham & Berrrow at 49 among Great Britain & Ireland’s Top 100 Links Courses. In 2017, National Club Golfer listed the 17th hole at Burnham & Berrow as one of the 100 Great British (Golf) Holes. And, Golf Monthly has ranked the Championship Course at Burnham & Berrow at #31 among its list of the Top 100 Courses in the U.K. & Ireland for 2017-18. As you walk off the 18th green at Burnham & Berrow, there’s a sign that thanks you for visiting the course. Then, it politely says that “we look forward to seeing you again soon.” That’s exactly what Gibson and Colt would say to you if they were alive today.